You will realize that driving your car may never seem to be the same again after it is evident that you will have to drive your car relying on one hand or without all your fingers gripping the wheel. Thanks to the Sure-Grip Spinner Knob you will spin the wheel like before and enjoy every ride like you used to. The knobs available at Sportaid have incredible benefits which I will share with you in this post. The knobs have been designed to leave your steering wheel without marks and without any damages. One size fits all steering wheels. The clamshell design is responsible for this amazing feature that will save you the hassle of looking for wheels that it can fit. The Sure-Grip spinner Knob offers you a quick release function. This allows you to easily remove and fit by the touch of a button. The components of the knobs are made of tough, long-lasting material hence it is a heavy duty device. 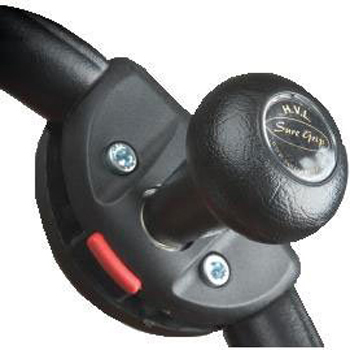 The Sure-Grip is made with keenness and will not move once it has been clamped on to the wheel. The unique clamshell design also offers a 3″ clamping surface for a perfect clamp. It is super easy to install on your wheel and remove it in case another driver needs to drive the car, and as I mentioned earlier it does not damage your wheel unlike other knobs. The knob has a solid fit the ball-bearing spindle allows you to turn with one hand in a flash. Hard turns are well taken care of too with these knobs. The spinner knob is made from the high-quality material; it is a quality product with that ensures both your safety and confidence on the wheel. It may be a little easy to install but that is not the reason you should miss out on this knobs because with regular use you will master how to fit and remove it from your wheel. The Sure-Grip Spinner Knob is an excellent device that will put back the power of wheel control in your hands. Sportaid offers amazing prices and they do not stop here, check out their money-saving discount offers and oh! did I mention that they have a ready-to-serve you customer support team that treats every customer like they were their last and only customer?